Viña del Mar is Santiago’s closeby seaside cousin, just a little bit over an hour away on one of the country’s busiest highways. 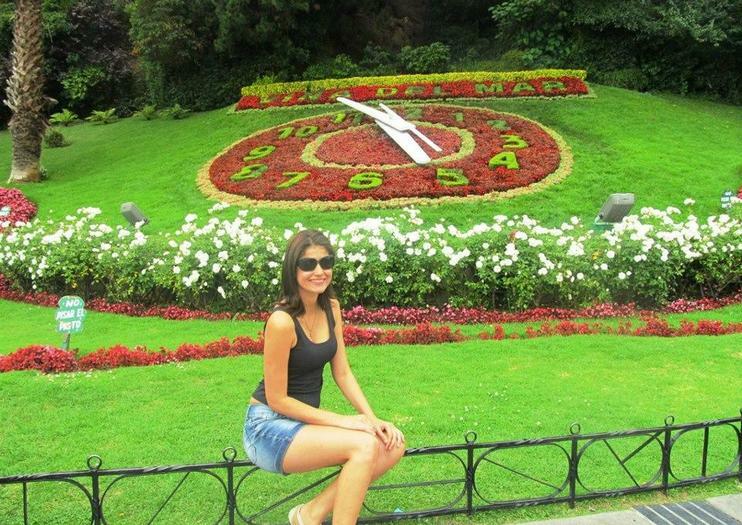 Viña, as it is commonly called calls itself the garden city, for the profusion of flowers, all over the city, and at Quinta Vergara, the large park there, as well as the iconic flower clock that faces the ocean walk so popular among locals and visitors. In the summer, Viña fills up with Chileans as well as Argentines from just across the Andes, and international visitors as well. There are restaurants and nightlife, close proximity to more historical Valparaíso, and of course, the long Pacific coastline. Viña del Mar also has a casino and a couple of other points of interest, including a castle you can visit, and the aforementioned Quinta Vergara park, where the summer song festival is held ever February. And there are also a couple of museums, with the most famous being the Francisco Fonck Museum of Archaelogy and Natural History marked by a stone moai outside. The museum houses artefacts from many indigenous Chilean cultures, including the Rapa Nui (from Easter Island). It also has a large display on insects, including giant crickets, blue morphos butterflies and iridescent scarabs. Even if you weren’t planning on going anywhere, be sure to check out the MERVAL, or local train. With a view unlike any other subway you’ve ever been on, straight over the Pacific Ocean, it’s well with the couple of dollars it will cost you. Experience the color and culture of two Chilean coastal towns on a full-day private tour from Santiago. On the way, sample delicious wines in the verdant valleys of Chile’s prime winemaking region, then discover the gorgeous greenery of Vina del Mar, a seaside gem declared the ‘Garden City.’ Immerse yourself in the bohemian beauty of Valparaiso as you stroll the serpentine streets with a knowledgeable guide, visiting the historical highlights of the UNESCO World Heritage-listed city. Convenient round-trip hotel transportation is included in this tour. Discover the gems of Chile’s Pacific coast on this private full-day tour from Santiago that takes you from the capital to the coast. Admire the towering sand dunes of Concón, the palm-fringed beaches of Viña del Mar and UNESCO-listed Valparaiso, famous for its brightly painted houses. Your private tour includes hotel pick-up and an activity of your choice – either enjoy a thrilling surfing class, take a bike tour or explore the seafront on horseback. Combine two popular Santiago day trips into a single day of exploration on this guided tour to the UNESCO-listed city of Vina del Mar and the hills of Valparaiso. Learn about each town's distinct history and culture while stopping to visit its main attractions, including the Flower Clock, Chile's historical first casino, and a local residential neighborhood. This private tour is limited to 10 people or fewer to ensure a more personalized experience. Discover the dazzling sights and architecture of Chile’s most colorful coastal towns on a relaxed, full-day tour from Santiago. Venture through the verdant vineyards of a region hailed as ‘wine country’ before arriving at the beautiful town of Vina del Mar. Gain insight into the area's history and view impressive historical monuments, then appreciate the bohemian beauty of Valparaiso. Take a tour of the town’s top sites and visit the Pablo Neruda Museum before returning to Santiago. Explore Chile’s scenic coastline and a UNESCO World Heritage Site on a full-day, private tour from Santiago to Viña del Mar and Valparaiso. Ride a horse along Concon beach, enjoy a lunch of local cuisine, and soak up the colorful, bustling atmosphere in a pair of port cities. This private tour includes hotel pickup and drop-off in Santiago and an hour-long guided horse riding experience on the beach. Whether you're practically a pro-surfer or it's your first time hitting the waves, this surfing tour from Santiago will help you enjoy Chile's beaches to their fullest. Take a class with a certified surf instructor, taking breaks to enjoy an included lunch and relax on the shore. Going as part of a guided tour ensures hassle-free transportation to one of eight popular beaches, as well as the security of working with a qualified instructor. Hit the road for a full day of exploring and surfing on Chile’s coast, with a full-day private tour from Santiago that can be tailored to your group. Walk the Dunas de Concon, take a surf lesson at Concon Beach, then discover Viña del Mar and Valparaiso, whose historic center is a UNESCO World Heritage Site. This full-day tour includes all activities, and round-trip transport from Santiago hotels, and it offers the personal experience of a private tour. Discover the Chilean coast with a private guide on a full-day tour of Concon, Viña del Mar, and Valparaiso that includes a scenic, 9.3-mile (15-km) bike ride along the water. Along the way you’ll explore towering sand dunes, see some of the area’s top landmarks, then visit historic Valparaiso, a UNESCO World Heritage Site. This full-day tour includes pickup and drop-off at Santiago hotels, bike rental with the fun, personalized experience of a private guide.